Alberto Paulon is the second cyclist in the image. The collision happened few video frames after this image. Read more about the incident here and here. A few days ago on a road in Melbourne Australia a car door was opened. Alberto Paulon was cycling past the car at the time. He collided with the door, fell into the path of a truck and, sadly, he died. This tragedy could and should have been avoided. Injuries and deaths due to "dooring" incidents are common around the world. Such incidents are sometimes viewed as an unfortunate side-effect of cycling, a problem requiring driver and/or cyclist education. Cyclists should not be under constant threat of death depending on how they position themselves on roads. There is no reason for roads to be designed in such a way that danger results from mistakes by their users when they could be designed to reduce the chance of mistakes becoming tragedies. Door zone collisions can be almost entirely eliminated by changing the design of roads. This blog post illustrates how that can be done. What's wrong with Sydney Road, Melbourne ? 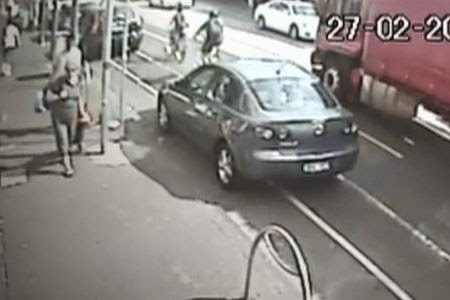 The road on which this incident happened is in the Brunswick area of Melbourne, which has a high rate of cycling for an Australian city. Unfortunately, while the people who live in and use the shops in this area cycle quite frequently, the road is designed to serve those who are passing through in motor vehicles and no proper separate space has been found to keep cyclists safe. A twenty-one metre wide road is more than wide enough to allow cycling in safety, and more than wide enough to provide cycling facilities which are free from the "door zone" problem. However this will require making a choice of what the purpose is of Sydney Road. Is the purpose of Sydney Road to provide a route for trams, for motor cars and trucks or is it a local shopping street. While there is an attempt to make this road serve all types of users it is likely that it will not serve any of them well. Cyclists are amongst the most vulnerable users of any road and therefore amongst those users most likely to be injured or killed as a result of inadequate infrastructure. The photos below come from Groningerstraat in Assen. Groningerstraat is a through road of approximately 18 metres wide. This makes it three metres narrower than Sydney Road in Melbourne. Despite its relative narrowness, Groningerstraat provides a very high quality environment in which to cycle. It's very convenient and also very safe. Dooring is almost impossible in Groningerstraat. Layout of Groningerstraat. 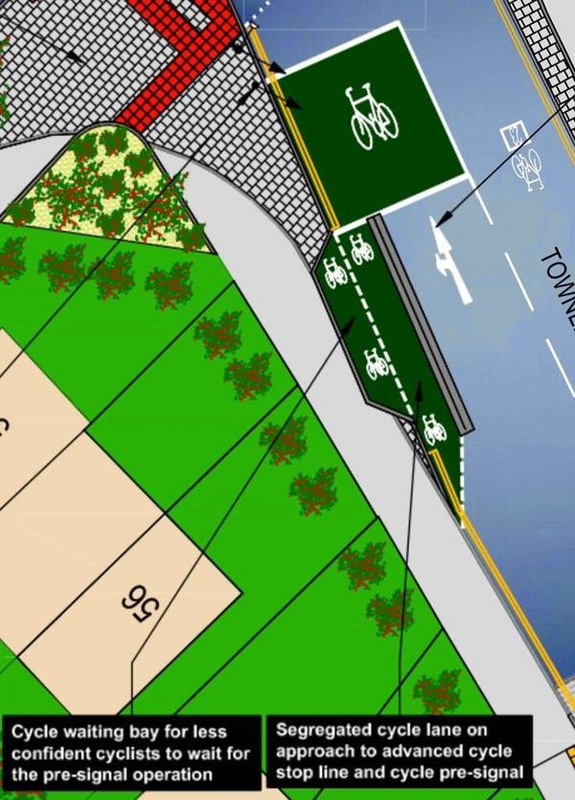 18 m in total are divided between 1.8 m wide pedestrian paths, 2.2 m wide unidirectional cycle-paths, 2.8 m wide lanes for motor vehicles leaving space for green buffers, drainage and car parking. Thanks to Streetmix. Safe, sociable side-by-side cycling is possible in both directions along Groningerstraat. Car parking alternates from one side to the other along the length of the road. The pedestrian and cycling infrastructure is constant. Angled "forgiving" kerbs are used so that a cyclist who makes a mistake and collides with the kerb will simply mount the pavement and continue for a while rather than being injured. Note that in this photo the cyclists shown are riding racing bicycles. It was taken during one of several large racing events which take place in Assen. Racing cyclists use cycle-paths in the Netherlands because there is no advantage to riding on the roads. The drain provides a gap between parked cars and the cycle-path. It provides a significant part of the total space required to open a car door. In any case, the cycle-path is wide enough that two people can pass an open door side-by-side in safety. If there are more than two side-by-side then cyclists can mount the forgiving kerb should they have to. Remember that in the Netherlands it is usual to ride on the right so most people wouldn't come close to a car door and in any case there is no risk of falling in front of a motor vehicle if they crash for any reason. There are several reasons why cycle-paths in this position do not create a dooring risk. 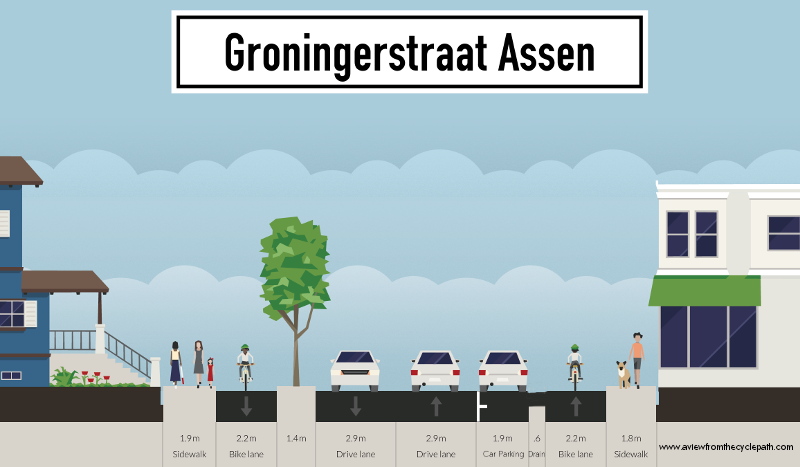 It is normal in the Netherlands to cycle on the right, and that places an individual cyclist as far away as possible from parked cars as they are passed. If you live in a "drive on the left" country like the UK you need to reverse this image. The drain / buffer between parked cars and the cycle-path is wide enough for a significant proportion of the total car door side. The cycle-paths are of a width which allows two cyclists passing side-by-side to very easily pass an open door in safety. If a cyclist swerves away from the car then they may meet the kerb between the cycle-path and the pavement, but this is an angled "forgiving" kerb over which it is possible to cycle in safety so swerving won't result in injury. The Netherlands is a left hand drive country. Therefore doors of cars parked in the conventional direction (the blue car above is parked against the flow) will most frequently be opened on the opposite side of the car from the cycle-path. This is residential parking, not business parking. Therefore car movements are less frequent and car doors opened less often. It is possible for cyclists to swerve, stop or even crash without any danger of being run into by a motor vehicle. This means that the very worst outcomes are avoided because riding straight into a car door won't result in a secondary collision involving another motor vehicle - the cause of the death in Melbourne. Subjective safety principles require designing roads so that they are easy to use and forgiving of mistakes. These principles are credited with reducing the rate of injury and death on Dutch roads. A through road in Groningen with shops on both sides. Layout is similar to Groningerstraat, but this older example doesn't have a forgiving kerb or a gap between parked cars and the cycle-path. In-between parked cars there is additional danger to cyclists due to the metal posts shown above. Such posts should never be used to separate cycle-paths from roads. On colliding with such a post, a cyclist will almost certainly fall and that fall could be onto the road where a secondary collision with a motor vehicle is likely. A cycle-lane in from Assen. Cycle-lanes present a greater dooring danger to cyclists than a cycle-path for several reasons: 1. A cyclist who rides into an opened door can fall in front of a moving vehicle. 2. dooring is more likely because every car has a driver, who sits on the side of the vehicle next to the cycle-lane, while only some cars have passengers (average occupancy being around 1.2). On-road cycle-lanes are not good cycling infrastructure. In this case there are factors which reduce the risk. A 0.5 m buffer between parked cars and the cycle-lane offers some space for a door to open and the 2 metre width of the cycle-lane offers some swerving space for cyclists. Narrower cycle-lanes without a gap between car and lane are far more risky. Also note that these cars are parked next to residences. Therefore they do not move so frequently as they would if parked by shops. At this location it's also of note that the motor vehicle lanes are just 2.8 m wide. This is wide enough for all vehicles, with careful design ensuring that it works even through pinch points. This road leads through villages south of Assen, providing a safe route for cyclists to the city and beyond. Approximately 1 km of the route is shown in the video. On the other side of this road there is a canal. 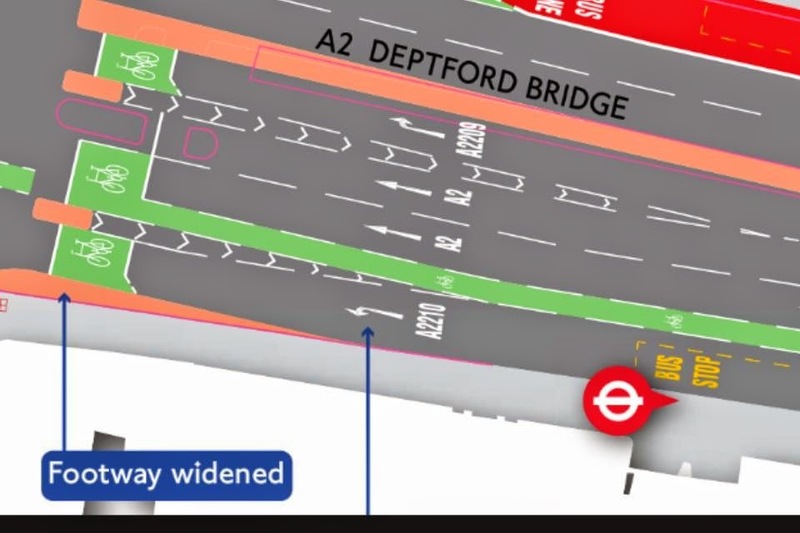 It would make no sense at all for cyclists to have to cross the road in order to ride in the opposite direction to that which I'm riding in so a bidirectional cycle-path is provided on one side only. This is older infrastructure so not ideal in several ways (narrow for a bidirectional path, not always a smooth surface) but it functions well and provides another example of how to deal with on-road parking and entrances. Tracey Gaudry from the Amy Gillett Foundation is quoted in the ABC news story as saying that The road toll is decreasing across the country on the whole except for bicycle riders. So what is happening is that the work that is being done to protect occupants of motor vehicles, not enough is being done to protect vulnerable road users, including bike riders." The same is true across most English speaking countries because while there has been a rise in the numbers of people cycling, there has not been any significant improvement in the safety for cyclists. Click here for details of the study tours. Lots of "Sydney Roads", not many "Groningerstraats"
Many roads across the world have the same problem as does Sydney Road in Melbourne. Many of them could be improved by following the same engineering principles as are demonstrated above. On the other hand, there are relatively few roads like Groningerstraat in which these principles can be demonstrated. That is why this road has featured on our study tours since it was rebuilt in 2007. Groningerstraat also demonstrates other examples of good design, such as an extremely safe and convenient traffic light junction and a very well designed and safe side-road crossing. Assen has many examples of good infrastructure which extend well past this one road. To see and learn from these and other examples of good design as well as to have problems caused by bad designs pointed out, book a study tour. What has become known as the "Dutch Reach" is the idea of teaching drivers that they should open car doors with the hand furthest from the door in order that they turn and have a better chance of noticing cyclists. This is claimed to reduce the incidence of dooring. It may indeed have a small effect, but it's mostly a distraction. The "Dutch Reach" is not the main thing which keeps cyclists safe from being injured by cycling into car doors in the Netherlands. The main thing which keeps cyclists safe is the design of infrastructure which makes dooring nearly impossible. That is what is described above. There is a campaign in Melbourne which has been calling for a cycle-path along Sydney Road for some time. London. 42 years behind and counting. The revolution still hasn't started. Two years have now passed since London's cycling "czar", Andrew Gilligan, told the world that his city was 40 years behind Amsterdam. London's mayor, Boris Johnson, has now been in power for more time than it took to transform the entirety of the Netherlands for cycling, with no substantial progress occurring under his time in office. London's record on achieving press coverage is phenomenal. There has been a lot of noise made in London about cycling. Unfortunately, actual building of well-designed infrastructure is another thing altogether. According to London's plans from two years ago, the peak year of expenditure is 2015. Yes, this is it. What does not get done in 2015 has less chance of being done later. This is the year when expenditure on cycling reaches its peak of £18 per person per year. That's about 2/3 of the usual Dutch level of expenditure. For the other years of the plan the expenditure level will be less than £10 per person per year, under 1/3 of the Dutch level. As I pointed out two years ago, the plans simply were not ambitious enough. London can never 'catch up' with the Netherlands by spending only a third as much for a limited period of time. 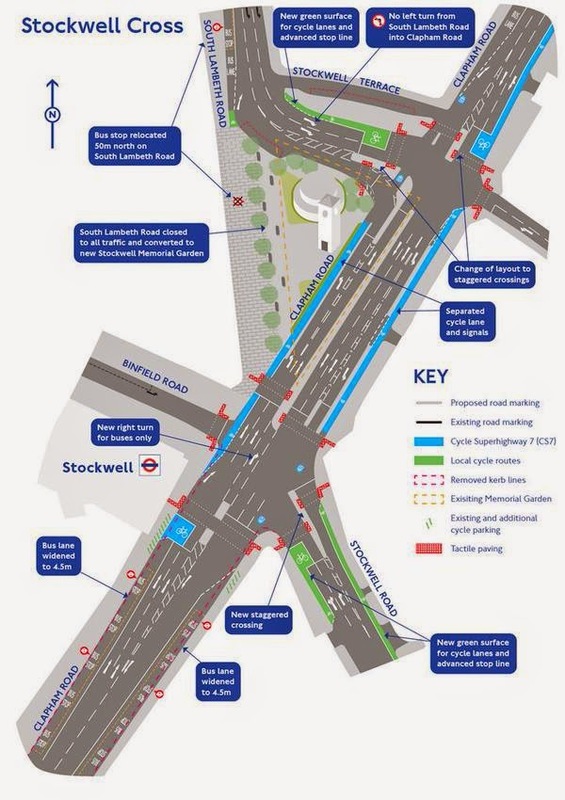 Perhaps this is why the target in London is for a mere 5% of journeys to be made by bike. Sadly, proposals for new infrastructure in London remain inadequate. Here are a selection of those which I've seen over the last year. Dangerous central cycle-lane leading into advanced stop boxes (including one in the fourth lane over). That's not cycling infrastructure, it's yet more paint. How many lanes and places to cross ? Why ? This proposal was praised in some quarters as at least including some segregation of modes. What it actually does is demonstrate that the designers don't understand that bicycles are not the same as cars. Cyclists don't need extra traffic lights which apply only to them, they should be able to avoid traffic lights in order to make cycling journeys faster. "Gobsmackingly bonkers". More ASLs, on-road lanes and the addition of a cycle-path which for some reason goes straight through the middle of a roundabout. Safe roundabouts for cyclists look entirely different to this idea. The "cycle waiting bay". A bizarre idea. How many people actually want special places where they can wait beside the road before continuing their journey rather than infrastructure which allows them to complete their journeys both safely and efficiently ? 'Advanced' lights, on-road lanes, multi-colour cycling facilties, dangerous multi-stage turns. Update May 2015: One that I'd missed which is so awful in design that it really must be listed here. A redesign for Queen's Circus Battersea roundabout which is actually under construction. In some places this has been described as "Dutch", but it's very far from any real design for a Dutch roundabout. This junction is also far too busy for a Dutch roundabout design so in the Netherlands this junction would in fact use traffic lights instead. As we can see form the photo, traffic lights are actually installed, so this won't flow freely like a roundabout. I'm assured that the cycling infrastructure under construction is actually narrower than that shown in the picture. 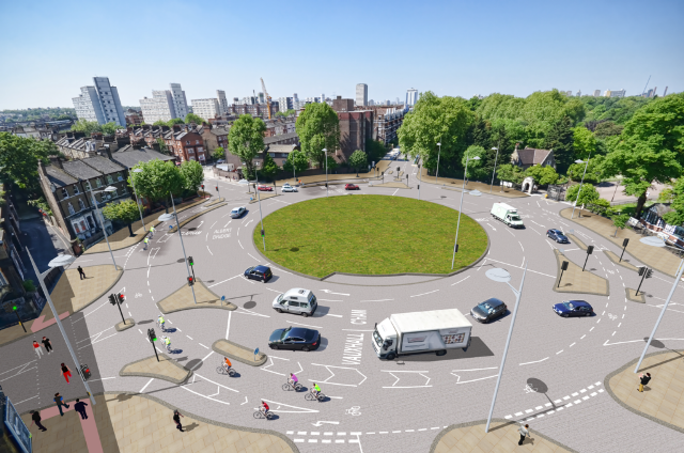 Update July 2015: Watch a video which demonstrates this roundabout in action. Enormously long delays for cyclists, combined with red jumping by drivers which puts cyclists in danger even after they've waited for a green light. Of course we've not only seen lacklustre plans like those above, but also completely preposterous ideas. 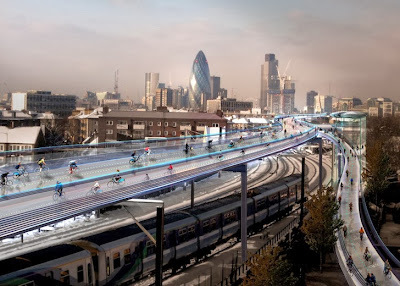 Cycle paths were proposed both in the sky and below ground, both of course far more expensive and less convenient places to put cycling infrastructure than where sensible people have been requesting it - ground level. But why stop there ? The Bounceway offered the intriguing idea of trampolining to work, backed by a grant from Transport for London to a company which went bankrupt shortly afterwards. There was also a proposal for a bridge full of trees over the Thames which it may or may not be possible to cycle over. Update 2018: Note that this proposal, which consisted of almost nothing when I wrote the previous sentence, turned into the "Garden Bridge" project, which was cancelled without anything being built but through a fantastic degree of mismanagement still consumed 46 million pounds. Discussing these things has wasted many hours of many peoples' time, detracting from focus on what the city should really be doing. It all demonstrates that London is still missing the big picture. 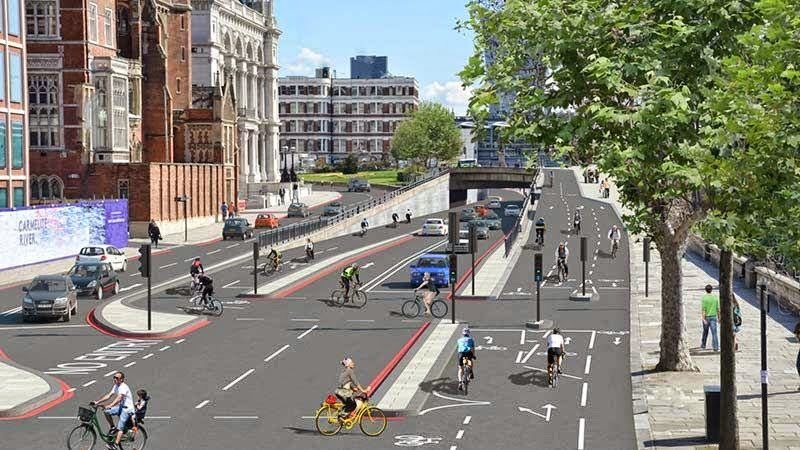 The lacklustre but serious proposals demonstrate that those working on road designs in London simply do not understand how to create good quality cycling infrastructure. The crazy ideas demonstrate something else: that those in charge don't know what to ask for. Cycling doesn't need buzzwords. press releases, mocked up pictures which show inadequate plans or exaggerated claims. Cycling in London doesn't need people on the other side of the planet to be told about things that you might get around to doing in the future. Stop putting so much effort into trying to get good press and far too little into achieving results. Length of headlines is far less important than length of cycle-path. The actual need of cyclists to be able to ride from wherever they live to wherever they need to go should not take a very poor second place to appearing to do the right thing to the world's press. London has started to use the language of a grid, though they've misunderstood the intention. What is required is a very fine grid. To try again to make it clear, I'll explain how it is from my home in the Netherlands. I have to ride for just 30 seconds along 30 km/h residential streets with no through traffic (we live in a cul-de-sac - a design of street which naturally reduces through traffic) to reach either of two very high quality cycle-paths (this one and this one) which between them provide me with an efficient and safe route to every possible destination in the whole country. This is nothing special - it's normality in the Netherlands. What's more, the cycle-paths making up the majority of the grid are built to an extraordinarily high standard and maintaining the integrity of even small parts of the grid can require some surprisingly large works. 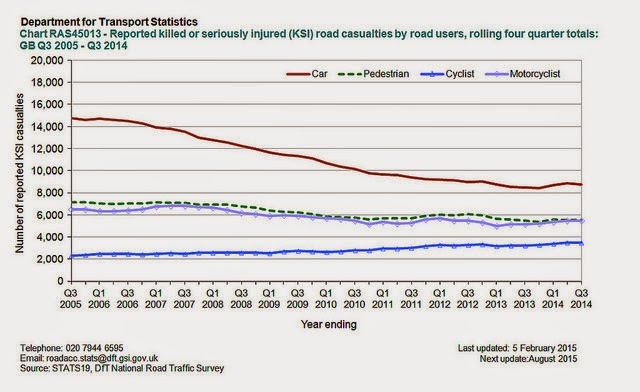 This is what leads to the very high degree of subjective safety required to make cycling attractive to everyone. Another concept which appears to have been misunderstood on its journey across the North Sea is that of unravelling of cycling routes from driving routes. London's "Quietways" are implied to mean something similar, but the emphasis is completely wrong. Rather than cyclists having direct main routes, they are given back streets. What's more, London's "Quietways" cannot even be expected to be quiet. This simply isn't good enough to effect mass cycling. Where cycle-paths cannot be fitted along narrow streets, unravelling removes motor traffic so that even the youngest of cyclists can get right to their destinations in the Netherlands. We'd like to help London to do the right thing, but this is only possible if the city will let us help. 2015 is to be the peak year for investment in cycling in London. However this doesn't mean that the figure of "£18 per head" allocated only for this year can be spent on new infrastructure projects in the city. It can't be spent in that way because their are already many other things for which the funds have been pre-allocated. One of the largest sinks for money is the public bike hire scheme in London. are good reasons why that is so. London is building public fountains rather than providing running water to every home. One of those "fountains" is the bike share system. I've been pointing out why bike share systems are not really a solution for mass cycling since 2009. Five years ago we discovered that London's hire bikes had already cost £23000 per bike, making them the most expensive bikes in the world. Operating costs for the system remain very high at around £24 M per year. This figure is around 1/6th of the total funding available for the peak year of 2015 and more than 1/3rd of that for other years, greatly reducing how much money is left over to spend on infrastructure which could enable everyone to cycle. Londoners owned more than a million bikes before the bike hire scheme started. A lack of bicycles was never the reason and is still not the reason why so few journeys are made by bicycle in London. The problem was and remains a lack of truly safe places to ride a bike. Does London have unique journeys ? People often imagine that their own cities have problems which don't exist in the Netherlands and that this makes it more difficult to accommodate cycling. That really does not apply to London. Londoners makes the same journeys as Dutch people, both by length of journey and for purpose. However rather than making these journeys by bicycle, Londoners use other means including the car. Travelling by bicycle is not attractive in London now because of the conditions which people face on the streets of the city scare the masses away. We already know how to attract everyone to cycling. There's a very good working example of what truly works a few kilometres to the East of London and I'm very happy to demonstrate it to anyone who is interested. Unfortunately, the over-selling of London doesn't only affect the UK. Hype from London spreads around the world. This leads to people in such places as Tokyo and Belgium seeing London as an inspiration - and therefore looking most firmly in the wrong direction rather than seeking to emulate best practice. Some readers may be aware that the British government announced extra funding for cycling two days ago. Unfortunately, as is usually the case, the extra funding announced is far too low a figure to make a real difference. 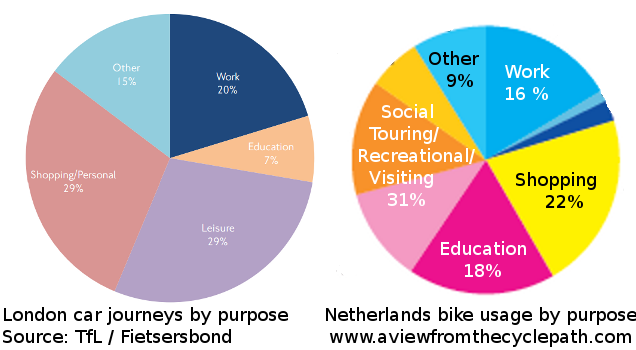 In order to match the Dutch level of expenditure, the UK needs to spend more than £2 Billion pounds per year on cycling, but all that has been promised is £114 milion spread across four years and only available to be spent in some areas of the country. children look like when they cycle. The latest announcement follows a familiar pattern by using big and impressive sounding numbers in a way that may well confuse readers so that they think that cycling is being funded well. In reality even the largest number in the announcement ("This brought the total investment in cycling by this government to £588 million") reveals a paucity of ambition. That £588 Million spread across the five year life of the present government leaves us with British government funding for cycling which is still at a rate which is only around 1/16th of that required to match Dutch levels of expenditure. This level of funding does not represent an improvement over the early 1990s when cycle funding already hovered around one pound per person per year. 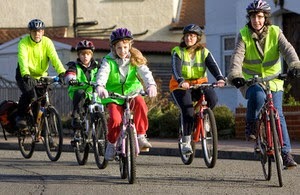 The Deputy Prime Minister claims that Britain is "in the midst of a cycling revolution". This is the sort of language which we have heard many times before, and also claims that "this money can help Britain become a cycling nation to rival the likes of Denmark and the Netherlands". It's simply not possible for Britain to begin to rival countries which are decades ahead in cycling until the government takes cycling seriously. Far from proving that the government has begun to do that, this announcement actually proves that cycling is still not being taken seriously in the UK so we should expect a continuation of cycling at a rate of around 1-2% of journeys. You can't catch up by running slower than the people who are ahead of you. The UK's cycling decline took decades of under-investment and to make cycling normal once again requires decades of a high level of investment. I was in Britain last week to visit family. While there, Sustrans called on people to celebrate 20 years of the National Cycle Network so I dutifully borrowed a bike to ride along roads which are far busier than they should be in such a small town in order to take photos. NCN 33 wiggle onto a muddy beach. If the tide is in, what then ?, swim ? We're supposed to #celebrate20 this ? What passes for the National Cycle Network in this part of the UK consists of several signs threatening a £500 fine to anyone who dared to ride on a wide pavement to avoid the traffic, followed by a very small and out of the way sign telling people to ride on the pavement for a short distance, and then an inconvenient wiggle down onto a beach which has mud so sticky that one of the world's very few hovercraft rescue services was established in the area to pull people out of it. Celebrate what, precisely ? This is not the efficient go-everywhere cycling infrastructure required to get the masses to see cycling as convenient. I also visited a new housing development which was repeating the same mistakes as other new developments in the UK. i.e.it was designed only for cars, but with the twist of providing so little space for cars that there's nowhere to park them but over the pavements. In order to convince people to use alternatives to driving, the alternative must be realistic. Carrots work better than sticks. The same mistakes are being repeated time and time again in the UK. Now that even that lacklustre target has been abandoned, what now for London ? Andrew Gilligan has used the spectre of "fending off" myself and other "people like that" as an excuse not to be available to the public on social media, particularly through Twitter. Readers may remember that I've actually offered to help London on many occasions. Invitations were first sent in 2005 before our first study tour in 2006. They were sent again, to Boris Johnson, in 2008. Since that time I've offered study tours free of charge to Boris Johnson on two occasions: Once in 2011 and then again in 2013. Note that only the second offer dates to the first offer dates back to well before Andrew Gilligan started work in London. The second free invitation was extended to him as well as to his boss, Boris Johnson. I don't offer to work for free for no reason. I did so because I genuinely wanted to help and I did not want the cost of the tour to be in any way a reason for London not to send representatives. We have still had no official contact with either Andrew Gilligan or Boris Johnson. Not even a proper acknowledgment of our invitation having been received. It is disappointing that Andrew prefers to try to discredit me by slighting me as he did at the Hackney Cycling Conference rather than engage with me and my genuine attempt to help London's authorities to improve conditions for the people who live in the city. As I pointed out over a year ago, London's (and the UK in general's) lack of interest in tackling cycling is killing people. People die every day, either from their lack of exercise due to driving or from the danger on the roads due to traffic. It's an ongoing emergency situation. counted, so I could not help the country avoid catastrophe. Boris Johnson is no longer the mayor of London. He is now leading a campaign for the UK to leave the EU and he has ambitions to become the prime minister of the UK. Please remember that this is the same BJ who was "fired from The Times in 1988 for fabricating a quotation" and who made his name by taking an extreme euro-skeptic position, inventing many of the ridiculous myths about the EU which have since been comprehensively busted. Note: Most of the invitations which I've sent to London were sent before Andrew Gilligan started working at the city in 2013 and before I joined Twitter in 2011. The idea that Andrew Gilligan should particularly be concerned that I'd contact him through Twitter is patently absurd.